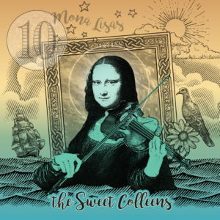 George Graham reviews The Sweet Colleens' "10 Mona Lisas"
Thanks to the popularity of groups like Mumford and Son and the Avett Brothers, folk-rock is enjoying a revival in popularity, often bringing in traditional instruments like fiddles, mandolins and banjos. I supposed it could be seen as a kind of reaction against, or perhaps an antidote to, computer-generated, digitally manipulated commercial pop. This week we have a group from Minnesota who combine folk rock with Celtic influence and a good helping of fiddle to create an attractive blend of original music and arrangements of traditional tunes. The band is called The Sweet Colleens, which certainly sounds like a group of Irish women, but they are five guys from the Minneapolis/St. Paul area, who have released their fifth album called 10 Mona Lisas. The Sweet Colleens got their start back in 2000 when they began working together, made a collection of demo recordings and put them out. They released more formal full albums in 2005, 2010 and 2013. Most of the material on 10 Mona Lisas was done in 2017, but they have recently begun promoting the album nationwide. The group’s front-man is Jeremy Greenhouse, whose instrument is the fiddle, but the band has a solid rock rhythm section with Dave Bade on bass, also some cello and mandolin, and drummer Will Loescher, who certainly plays like a rock drummer. Rounding out the group are Pete Sandvik who plays accordion and keyboards, and Scott Keever who handles guitar – electric and acoustic – and Dobro, which is often heard on the album. Jeremy Greenhouse is credited with composing the band’s original music, but they also draw on traditional Irish tunes, plus the work of Irish musician Andy Irvine and a little Woody Guthrie. The material can be quite electric at times, and more folky at others. But even when the instrumentation is otherwise acoustic, there is a driving rock drum sound that keeps the energy level up. In that way, they are hewing to a similar approach as the alternative influenced bands, though the Sweet Colleens are somewhat more traditional in their sound. Also from the traditional world is Black Eyed Suzy, which the band does at a frenetic pace. The Minnesota based group the Sweet Colleens, bill themselves as “fiddle-fueled accordion-infused Celti-Cajun folk pop,” which is a pretty good description of their rather wide-ranging mix of rock with folk elements from both sides of the Atlantic. Their latest album 10 Mona Lisas has a nice mix of their appealing lyrically-straightforward original songs, along with traditional material, with the latter generally served up in electric style. The musicianship is first rate and their arrangements and record’s production are tasteful all around. Our grade for sound quality is close to an “A.” The sound is clean and studio effects are kept to a minimum. And the recording nicely handles the mix of the electric and the acoustic instruments, without the former overwhelming the latter. Fiddles, banjos, and the like are definitely making inroads again in electric music as the folk-rock revival continued to unfold. The Sweet Colleens stand as a very likable example.